WASHINGTON, DC -- The smoldering conflict in Ukraine’s eastern provinces has now gone on for more than two years. Although an uneasy status quo has settled on the region, skirmishes continue, and tension periodically run high. With the prospect of open, large scale conventional combat receding, the focus has shifted to the tactics and weapons that either side can use to press the other at the margin, to recapture a sliver of territory, or increase the temperature on the enemy. Here are five kinds of weapons that Russia uses to maintain pressure on eastern Ukraine, and Kiev as a whole. Unless it decides to expand its incursion into Ukraine, Russia’s ability to hurt the Ukrainian government depends on its willingness to leverage airpower, economic power and cyber-power. Of the first of these, Russia has been reticent to carry out direct attacks against Ukraine with either aircraft or ballistic missiles. Given the weakness of the Russian economy, Moscow can offer less and less in terms of coercive economic statecraft. But in the cyber-arena, Russia remains dangerous. As Thomas Rid and others have argued, the prospects for “cyber-war” are a combination of murky and over-hyped. Nevertheless, Russia has established that it has the capacity to engage in annoying, often disruptive attacks against unfriendly cyber-networks. These attacks cannot destroy the social fabric on their own, but they can certainly prove costly to the targets. Moreover, cyber-attacks continue to carry a degree of deniability that saves Russia from paying the diplomatic costs of aggression. In the early days of the Ukrainian Civil War, Kiev tried to leverage its airpower advantage over the rebels by conducting airstrikes and other missions over the disputed eastern provinces. Central governments traditionally have airpower advantages over rebel groups, as the former remain in control of air assets and of the logistical framework necessary to keeping planes in the air. All of this made Russia’s contribution of surface-to-air missile systems extremely important to maintaining rebel control over the provinces in eastern Ukraine. Russia has reportedly contributed a variety of systems which, in total, have shot down almost twenty Ukrainian aircraft and helicopters. One of these systems also shot down a Malaysian jetliner in the most notable incident of the war. As long as Russia maintains what amounts to an air defense network over the wayward Ukrainian provinces (whether from Russia or from Ukraine itself), Kiev will struggle to defeat the rebels. When Russia seized Crimea, special operators paved the way. Soldiers in unmarked green uniforms formed the spearhead of the invasion force, quickly seizing key installations and cutting the peninsula off from the rest of Ukraine. These highly trained special forces have become one of Russia’s most effective weapons for keeping its near abroad in line. Russia has developed its special forces with great care, using them in Chechnya, Ukraine, Georgia, Syria, and elsewhere to create “facts on the ground,” military realities that become difficult for political and diplomatic forces to dislodge. In Crimea, Russian special operators managed to seize the peninsula before confused and distracted Ukrainian forces could react. In the eastern provinces, special operators have helped support and train rebel forces. Defusing and defeating these operators remains an exceedingly difficult task for Kiev. Over the past few decades the United States has de-emphasized the role of artillery in land combat, instead concentrating on mobile, precision-fires acting in support of mobile forces. Some believe that heavy artillery has become a relic of another age, while others worry that insufficient emphasis on what was once the “god of war” will leave the US vulnerable to conventional foes. 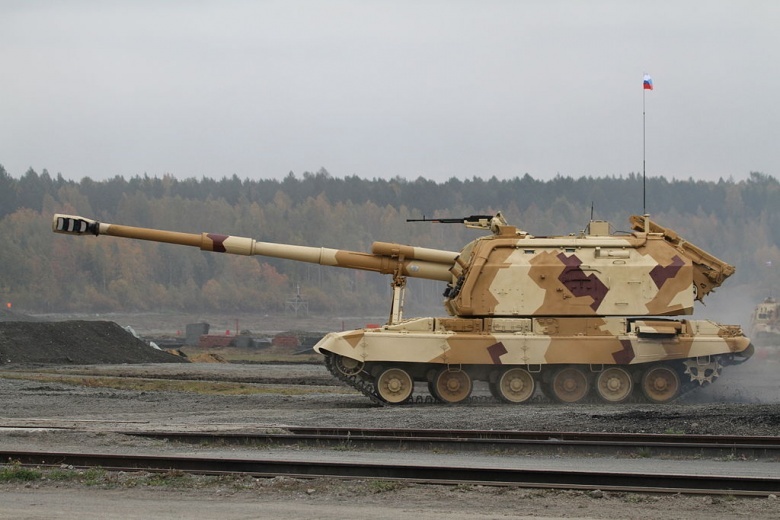 Russia, on the other hand, has continued to put a strong emphasis on the role of artillery fires. The effectiveness of Russian artillery can perhaps be overstated (a recent Washington Post op-ed painted a dire picture) but in Ukraine long-range artillery has played a critical role in allowing Russia to hit Ukrainian forces from the safety of its own borders. Without effective counterfire options, Ukrainian troops are at the mercy of artillery that they cannot hit back against. Russia was slower than the United States to make drone technology a central focus of warfighting, although it has taken aggressive steps to catch up. In Ukraine, unmanned aerial vehicles have become the most important means through which Russia keeps track of developments on the battlefield. Russian drones rarely, if ever, conduct the kind of targeted strike that has become common from their US counterparts. They also normally do not partake in the prolonged surveillance missions that the United States has invested so much attention in. Rather, Russia uses its drones in close collaboration with fielded forces, to identify and target critical enemy assets, including command centers, logistical centers and concentrations of troops and vehicles. With the information supplied by drones, Russian artillery becomes ever more lethal, especially to thinly protected troops and vehicles. Because of Western reticence about transferring lethal arms to Kiev, as well as Ukraine’s dire economic situation, there is no obvious path to overcoming Russia’s military advantages along the border. As long as Russia persists in committing men and weapons to Donetsk and Luhansk, Kiev will struggle to restore order, and recapture its territory. Over time, the once-robust Ukrainian defense industry may restore some of the Ukrainian military’s key capabilities. For now, Moscow continues to hold the most important cards. Quote: Все 10 бронеавтомобилей «Варта-2», которые в мае этого года приобретены для нужд спецподразделения Нацгвардии КОРД, были отбракованы и отправлены производителю на доработку. Указанная техника приобретена за государственные средства у фирмы «Украинская бронетехника», реальным владельцем которой СМИ называют депутата от «Народного фронта» Сергея Пашинского, сообщает интернет-издание «ua1.com.ua». Как пишет издание, бронеавтомобили «Варта-2» помпезно презентовали друзья депутата Пашинского – председатель СНБО Александр Турчинов и министр МВД Арсен Аваков. В то же время в ведомстве Авакова не озаботились тем, что до лета 2014 года фирма называлась «Укрглавпак» и производила пластиковую посуду. Однопартийцы Пашинского старательно восхваляли бронеавтомобили и подчеркивали необходимость покупки не менее 100 единиц техники. Несмотря на то, что все 10 первых бронеавтомобилей были отбракованы, Нацгвардия подписала договор на поставку еще 40 автомобилей «Варта-2». Об этом UA1 сообщил источник в Национальной гвардии. Пашинский, Турчинов, Аваков - Ганьба, Ганьба, Ганьба!